Get ready to earn retro rewards in the exciting new Pac-Man Wild Edition slot machine from Ainsworth Gaming! Spread across 5-reels and up to 75-lines, the game is based on the original hit arcade game, first developed by Namco in the 1980's. Pac-man is searching the reels for ghosts and power pellets to increase your rewards in this game. Additional wins can come from bonus features which include wilds, scatter wins, free games, bonus feature and extra chance feature! Get ready to earn retro rewards in the exciting new Pac-Man Wild Edition slot machine from Ainsworth Gaming! Spread across 5-reels and up to 75-lines, the game is based on the original hit arcade game, first developed by Namco in the 1980’s. Pac-man is searching the reels for ghosts and power pellets to increase your rewards in this game. Additional wins can come from bonus features which include wilds, scatter wins, free games, bonus feature and extra chance feature! Pac-Man Wilds – The Pac-Man Wild symbol substitutes for all symbols except the scatters, wild power pellet, pac-man and key symbol to complete wins. The Wild Power Pellet will substitute for all symbols except the Pac-Man and Key symbols. 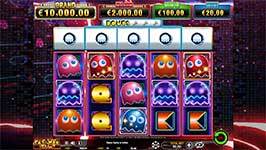 Free Games Feature – Land three or more scatters anywhere on the reels to win 8 free games. During the free games feature, the 5 extra reels on top of the main feature reels include the symbols Pac-man and Pattern only. When Pac-Man appears on the extra reel, power Pellet and all other symbols on the corresponding main feature reel below are transformed into Wild Power Pellet and Wild respectively. Bonus Feature – The Bonus Feature is triggered when 3 ‘Key’ symbols appear on the extra reels. During the Bonus Feature, a reel appears with ‘Extra Chance’ and multipliers of 2, 3, 5, 10 and 15! If the reel outcome is shown as a multiplier, you are awarded a prize multiplier times the total bet. Extra Chance Feature – During the Extra Chance feature, a reel appears with x10, x20, x30, x50, Mini, Minor, Major or Grand. If the reel outcome is shown as a multiplier, you are awarded a prize of the multiplier times the total bet. If the reel outcome is Mini, Minor, Major or Grand, you win the corresponding bonus prize jackpot!